As the new year begins, the United States Postal Service is telling customers about changes in 2019 that could impact their mail. Starting Jan. 27, Forever stamp prices will increase from 50 cents each to 55 cents each. The 10 percent increase is the biggest in USPS history. The price hike is to offset losses from 2018. The post office had its worst year yet, resulting in about $4 billion in operating losses. USPS said in November that sales from shipping and packages had soared 10 percent but rising pay and benefits and higher transportation costs led to the overall decline in revenue, Reuters reported. Postal employees said it is important to keep the stamp price increase in mind if you plan to print shipping labels at home. "If you come to the post office, we'll weigh it and put the correct postage on," said Eva Jackson, spokesperson for the USPS San Diego District. "If you're at home, that could create a problem if you don't have enough postage on there." Locals say they will be supporting USPS in a personal effort to keep the federal agency afloat. "Keep using the post office, that's my tip," said Kristen Winter as she was mailing letters at the Carmel Mountain Postal Store on Rancho Carmel Drive. USPS said that it had expected 16 billion letters, gifts and packages to be sent out between Thanksgiving and New Year's Eve. The estimate for 2017 was 15 billion. The service has been taking steps to compete with major online retailers like Amazon. During the busy winter months, some local post offices set up a drive through the holidays so that customers did not have to leave their cars to mail letters and packages. 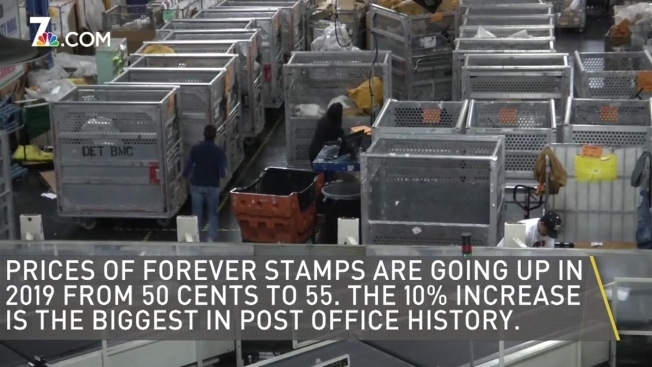 The Forever stamp price increase was approved by the Postal Regulatory Commission.